With the weather warming up here at Heirloom Flats (most days! ), we can’t help but think ahead to spring and summer. Time to get out of our apartments and enjoy the area! Here are some things we’re looking forward to in and around Bloomfield in the coming months. 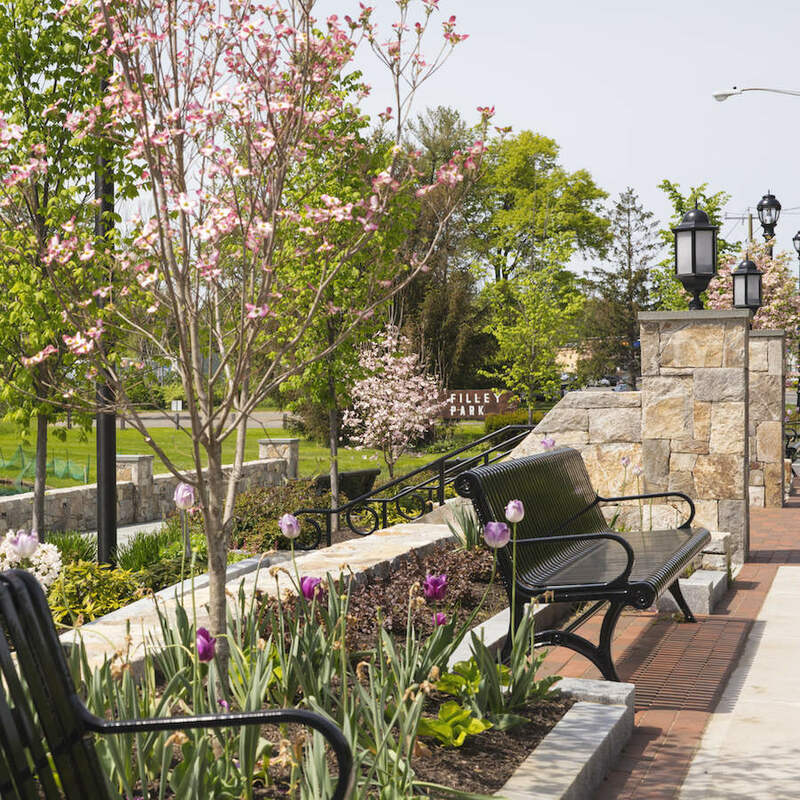 The warm months are a great time to explore some of Bloomfield’s many parks, playgrounds, and open spaces. Filley Park (shown in the photo) is always a good option. Maybe we’ll also head over to the Reservoir No. 2 and watch members of the Wintonbury Flying Club fly their model airplanes. (It really is something to see.) We’ve also got June 2 and 3 on the calendar. That’s Connecticut Trails Day Weekend, when group hikes are planned all over the state. There’s usually an event or two in Bloomfield at places like Farmington River Park or Auerfarm. Look out for walks in nearby Hartford, Farmington, and Simsbury, too. After a hike is as good a time as any for ice cream. (Any time is a good time for ice cream.) As we sat in our apartments in Bloomfield this winter, we dreamt about local ice cream stand Bloom Hill Farm reopening for the year. Usually, that’s in April. (Look for an announcement.) Nothing says spring like having a cone outside with ducks and peacocks in view. Come summer, we’re excited about the return of the Bloomfield Farmers’ Market—especially since it’s right in our backyard at Town Hall. But we’re also lucky to have several farmers’ markets in the Hartford area for our local food fix. Hartford’s largest farmers’ market, at Billings Forge, is about six miles from our apartments. So is the West Hartford Farmers’ Market, which starts up in April. June is the return of Celebrate Bloomfield, a festival showcasing the best our town has to offer. There’s already a tentative schedule of events, which includes a craft fair, hikes with the Wintonbury Land Trust, and tours of the Wintonbury Historical Society. Some of the events are right by Heirloom Flats. Locations include our neighbors the Prosser Public Library and Bloomfield Town Hall. It’s times like this that we’re glad to have our apartments right in the center of town. Speaking of the center of town, how about Bloomfield’s concerts on the green? They happen every Thursday evening from June through August and they’re a quick stroll from our apartments at Heirloom Flats. (No schedule yet this year, but you can see the lineup from last year.) We’re already thinking about the picnic we’re going to pack. In fact, we’ll take any excuse for a picnic, especially when it involves outdoor entertainment. That’s why we’re also thinking ahead to July and the Greater Hartford Shakespeare Festival. This family-friendly outdoor theater series happens on the campus of the University of Saint Joseph in West Hartford. But let’s not get too far ahead of ourselves. You really shouldn’t let June pass without seeing some roses in bloom. Fortunately, the nation’s oldest public rose garden, Elizabeth Park, is only four miles away from Heirloom Flats in West Hartford. It’s a perfect end to spring in the Hartford area.